All living things receive half of their genes from their fathers and half of their genes from their mothers. When scientists look at cells underneath an incredibly powerful microscope, they can tell that the genes inside cells are connected in this type of spiral shape, which is called a 'double helix'. 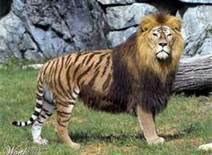 A Liger has a lion father and a tiger mother. Picture of a male liger. Male ligers often have the furry mane around their face that comes from their fathers. They also usually receive the stripes on their bodies from their mothers. 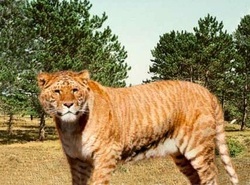 Picture of a female liger. Female ligers don't have manes (long fur around their faces) just like female lions don't have manes either. Their bodies are larger than most lions or tigers bodies are. We can still see the soft brown fur color from the lion father and the stripes in the fur from the tiger mother. Picture of a liger cub. How Cute! Wild..not for petting...but cute!